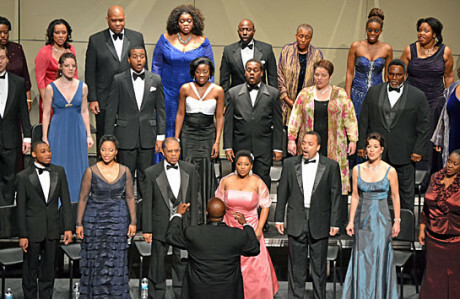 The American Spiritual Ensemble is a critically-acclaimed professional group composed of some of the finest singers in the classical music world. The vocalists have thrilled audiences around the world with their dynamic renditions of classic spirituals and Broadway numbers. Tenor Dr. Everett McCorvey founded the group in 1995, and many of its members have performed in such venues as the Metropolitan Opera, New York City Opera, Houston Grand Opera, San Francisco Opera, Boston Opera and in various shows on Broadway. They have also performed abroad in England, Germany, Italy, Japan, Ireland, Ecuador, Scotland, and Spain. Cherry has been a soloist with ASE since 2010. Notes: Tickets available at SU Guerrieri Center, Asbury Church, at the Door, and www.ticketleap.com. Address: 510 W Main St.
Notes: Celebration of American Music: joint concert with the National Chorale.